Jamie McGuire was born in Tulsa, OK. She was raised by her mother Brenda in Blackwell, OK, where she graduated high school in 1997. Jamie attended the Northern Oklahoma College, the University of Central Oklahoma, and Autry Technology Center where she graduated with a degree in Radiography. 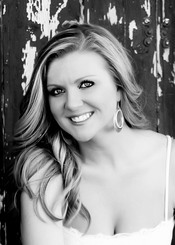 Jamie now lives in Enid, OK with her three children and husband Jeff, who is a real, live cowboy. They share their 10 acres with four horses, four dogs, and Rooster the cat.